In 2016 the American Literary Translators’ Association awarded poet and translator Kelsi Vanada a travel fellowship. 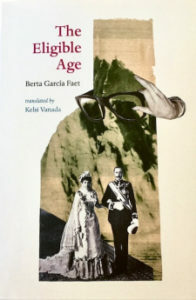 As a part of that award, she presented a poem from a translation-in-progress: Spanish poet Berta García Faet’s “Thirteen Theses on the Better Understanding of the Birds of Eligible Age.” The long poem — which one audience member aptly labeled as a feminist version of “Thirteen Ways of Looking at a Blackbird” — stunned me with its declarations such as “The blackbird was white until I found a blackbird,” which, while simple on its surface, contains multitudes. This direct observation about a blackbird is at once a funny anecdote and a comment on the way we come to know, or can’t know, the world around us. It points toward the shortcomings of the imagination and presumptions of whiteness in the European (and U.S.) imagination. This is Vanada’s debut full-length translation and the debut translation for Faet’s work into English. La edad de merecer, originally published in 2015, is Faet’s fourth book. The book includes a translator’s preface and a postscript by Unai Velasco, who draws parallels between this book and New Sincerity, Alt-Lit, and particularly Dorothea Lasky’s poetry. As Vanada puts it in her preface, the Spanish title is an “archaic idiomatic expression used when a woman was of the age to marry.” These poems are threshold poems, chronicling through observations, reportage, and vivid imagination—“if we name it; the limit of the duvet you stole in italy / when we went to italy / is the limit of the world / or of italy”—what it means to love another man or woman, and ultimately, what it means to understand and experience. The Eligible Age does not disappoint, which is to say it’s equally complex, surprising, and funny as the poem Vanada read at the ALTA conference. Comprised of mostly declarative sentences verging on aphorism, the book as a whole reads like a tractate. This feeling is furthered by the fact that the book’s poems are nested within a two-part series of numbers and letters that roughly follows a Harvard outline. Some of the section headers read like stand-alone poems, like “(3) pianist’s fingers + ludwig van beethoven’s face when i told him i wanted to write a poem with more or less rhyme + why i gave up music and why i mentioned the breeze at least once + optimistic greeting to successive lovers and to the ever-pluralistic you + cordial greeting to my first piano teacher (1998-2000).” Some of the poem titles are simply numbers or letters: (A), (B), (C), I, II, III, IV. 1. The world is the sum of facts and birds. 2. Every proposition has form (or syntax: the profile of a Siberian goldfinch) and content (or semantics: the belly of a Siberian goldfinch). 2.1. The contents of a glass of milk, which could be a human body transmitting songs about birds, are the lyrics of the songs transmitted by birds. 2.2. Form depends on the form of flight. 2.2.1. Let us suppose that thinking is flying and vice versa. Therefore, form depends on mental categories; that is to say, form depends on the structure—without words—of thought and flight. 2.2.1.1. Deaf-mute girls dress in words, or they dress in colorful words, in order to say. They handle these structures delicately, with words. 2.2.1.2. Structure and category are synonyms for skin. This book is a wild ride, braiding philosophy with sentimentality, mixing intimate reportage with zoology, and juxtaposing literary biography with gynecology. This debut translation is a remarkable work from a notable voice in Spanish poetry. Laura Wetherington’s first book, A Map Predetermined and Chance (Fence Books), was selected by C.S. Giscombe for the National Poetry Series. She has a chapbook just out from Bateau Press, chosen by Arielle Greenberg for the Keel Hybrid Competition. Her essays and book reviews have appeared in The Volta, Hyperallergic, Full Stop, Jacket2, and 1508. Laura teaches in Sierra Nevada College’s low-residency MFA program and co-edits textsound.org with Hannah Ensor.